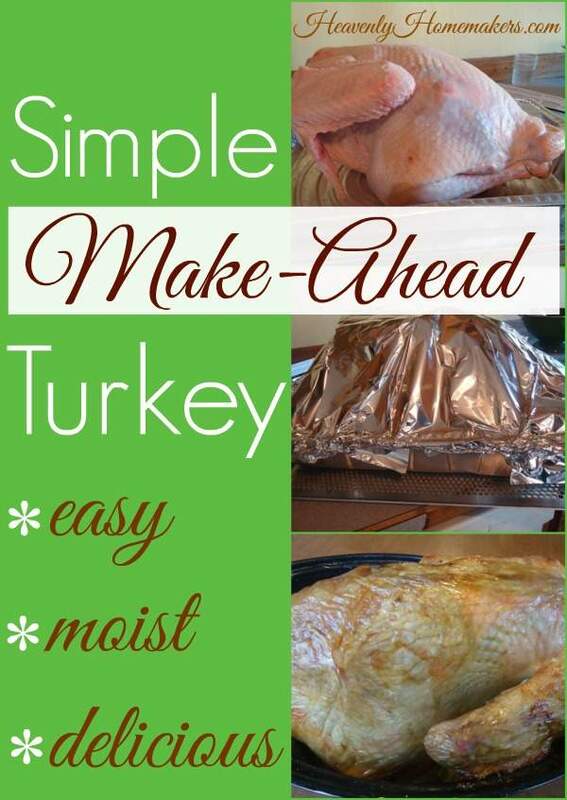 Make-Ahead Turkey - Yes You Can! I will have to share this post with my mom. She is usually responsible for the turkey and gets up at a ridiculous hour to get it into the over. Thank you for the tips! I’ve never done a turkey ahead of time. Actually, my brother is the expert; he grills it, and I can’t get even close to the flavor he gets out of it! I have always baked the day of. This year, tho? New (to us) house, new (to us) State, and new (to us) tradition of baking the turkey ahead of time! Hmmmm. I wonder where the roaster is packed? What a great idea! Thank you for the great tip! I was in charge of turkey one year and ugh… I don’t like it because of the tedious work. Next year they put me on cheesy grits. I thought “grits at thanksgiving?” But no, these are the best grits ever! My aunt made her turkey ahead of time last Thanksgiving and warmed it in the crockpot with broth the day of our big family gathering. It stayed warm all day so we could piece off of it. It was delicious! I’ll definitely be doing this in a few weeks! My husband is completely against the day before. Thinks it will be to dry. I’ll have to try again to convince him because it sure would be simple. I’ve never made the turkey ahead of time, but we usually have pretty casual holidays without any non-immediate family members. If we were having a big group for thanksgiving, I would definitely want to try this method! Sounds like a great way to cook the turkey. It’s so hard on Thanksgiving because everything else that needs to go in the oven to cook must wait. I like the tip about how to make turkey broth with the bones…thanks! I may have beenthe only one thinking, I should make two or three and put it in pans in the freezer for quick winter meals. I am thinking this….. and am cooking one today. I got two, buy one get one free from the store. Last year I cooked a turkey that looks like the one you pictured (or maybe even bigger?) 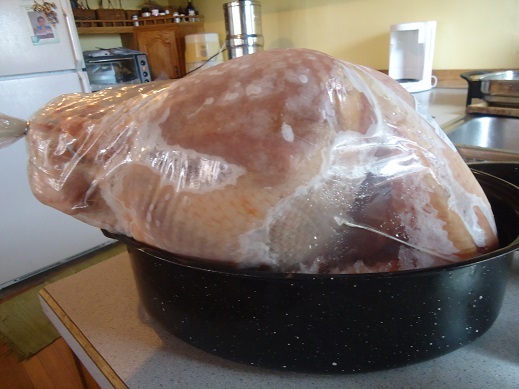 Those farm raised birds get big…I think ours was 35 pounds or so and not even close to the biggest one they grew! I did the low and slow method and it went in the night before. It turned out really good, but this method would be awesome for saving the clean up on a busy kitchen day. My only fear would be losing the awesome smell of a cooking turkey. That is the perfume of Thanksgiving to me :) And we froze a ton of meat from that bird. We ate turkey all winter! How big is your oven? Where in the world did you find a pan to fit a 35 lb turkey? I have a standard oven and there’s no way a 35 lb turkey would fit in it. Never thought of doing that…what a great time saver! I’m with Julie-I will share this tip with my mom; that turkey mess is always such a drain on Thanksgiving Day (now to convince my dad that it’ll be ok…). Thanks! I’m with you, Laura. Making the turkey ahead of time is what I do, too. I have never tried pouring broth over the meat before putting it in the fridge, but I do save the skin during carving and lay it back over the meat before putting the cover on my pyrex dish. That really seems to help. I am definitely using this method of turkey prep this year. It will significantly reduce kitchen chaos on Thanksgiving. Thank you for the stress-reducing method! We have one of the fellows in charge of the turkey – either dad or my brother. And we grill it or deep fry it outside . That frees up the oven for the other dishes, keeps the kitchen a bit cooler, allows everyone to sleep til a reasonable hour. Cooking it on the grill or outdoor fryer has the added bonus of reminding the men-folk how much WORK goes into putting on a nice spread since they are the ones running out in our Wisconsin snow to check the grill/fryer. I also come from a huge family so we do dinner potluck style so no one person is overwhelmed with cooking, hosting, and clean up duties. It’s great! Might be trying it this year to save some time! This is how my mom made her turkey dinners and she always received compliments. The meat was always moist and tasty. Thanks got the reminder! We’ve done something similar for years out of necessity. There are so many of us at the holidays we need more than one turkey, plus we usually do a ham as well! My husband usually makes the turkey, but it’s nice to have this option. Last year I had to cook turkeys for our church dinner which was a few weeks before Thanksgiving. I put the leftovers in the freezer. I took it out for my family’s Thanksgiving and added leftover broth (also previously frozen) to reheat it. It was great. No complaints, and less work for me that day. I’ll have to pass this along to my mom. Luckily for me, my family goes to her house every year and I don’t have to cook. I bake my turkey ahead of time too. Instead of reheating in the oven I use my crock pot. That way I have oven space available. Well what a new idea! Great way to make sure the turkey is cooked all the way for Thanksgiving! Last year I guess ours was still a little frozen in the middle- and it didn’t get done until a few hours after the dinner. Wouldn’t happen with this! Great idea! I love doing this with chicken also. ???? great idea! thanks for the tips. I absolutely love this idea. I always feel like it’s hard to enjoy Thanksgiving because there is so much work to do. I want to try getting all the big jobs done before the big day! Love this idea! We’re going a slightly different route this Thanksgiving and deep frying our turkey! Might be a little more labor intensive, but I think it’ll be worth it this year – the kids are all looking forward to the whole experience. What a great, time-saving idea! It works great to freeze with some of the broth to use later too. I freeze it smaller servings too. The broth helps it not to taste warmed over to me. I did this last year, and it was so easy and good. We cook it the day before Thanksgiving. Then, we reheat some of it and leave some for those who prefer to eat it cold. Brilliant idea! . . . I especially approve of having the clean up taken care of before the guests arrive. I’m going to try baking my turkey early. No carving traditions here either. Sounds easy – thanks for making it simple! I forgot you cook your turkey ahead. I usually cook a large breast for the 4 of us because I don’t like dealing with carving a turkey at the end of the day. Could you make this post earlier next year for those of us who plan our menus far in advance? I cooked most of my Thanksgiving dinner in August and froze it since my parents are coming for a week. I’ve already planned to marinate and cook two breasts. I just may have to try cooking my turkey this way this year. I like that idea. Thank you! Thank you for sharing your cooking ideas/recipes with us! Great idea! I have a small enough group to get away with doing just a turkey breast in my crock pot, but I will be using this idea next time (and for chickens in the mean time). Thanks, Laura! Thanks for all the great tips on how to treat the turkey after it’s cooked for use later. I just have one thing to add — avoid the whole defrosting mess in the fridge by cooking it frozen. I’ve done this the last couple years. It could not be easier and it turns out great! The theory is the breast doesn’t dry out because it takes longer to thaw and so the timing works out perfectly with the smaller dark meat pieces getting done. I just know it works and it saves a lot of potential germs all over the kitchen storing and handling a raw bird for multiple days. Started cooking my turkeys ahead of time about five years ago. I would never go back to cooking it the day of with all the mess and craziness! We use a rotisserie to cook our turkey day of. The skin gets crisp, the turkey is moist, and it doesn’t take more than a couple hours to cook. The two problems though are you still have the mess day of and our rotisserie doesn’t hold more than a 12-lb bird. It’s tastes really good though!! I am in charge of the ham at the holidays and have been doing this for a couple of years, but never thought to do this to turkey! What caught my eye in this post was your brief mention of making turkey bone stock and blending the vegetables back into the broth. I recently accidentally made some awesome veggie broth with carrots and broccoli and wanted to repeat it but didn’t want to dispose of the veggies. Now I know what to do! Our turkey tradition is to say “Oh that looks delicious!” and keep complimenting my sister-in-law and brother who typically make the turkey. :) For the past 5 or 6 years, we’ve all made a portion of the meal so no one is overwhelmed. Turkey is pretty expensive here in Paraguay, but I’m tempted to see if it will be cheaper this year just so I can try this! If not, maybe I’ll just do the same with chicken. This is a wonderful idea! I just might have to try it this year. I’m a cook all day kind of girl, especially with the turkey, but I think I’m going to cook it a day or two early this year. I like this idea. Some days really do not need all the stress. Typically we have done Thanksgiving dinner at our house and cooked the day of. Last year my parents moved closer and now we celebrate at their house! I’m thinking of trying a cooking bag for my turkey this year. Does anyone have experience with those? Does the turkey turn out good flavor and brown and moist? I would think clean up would be much easier too? Although I don’t think you would get a crispy skin, but maybe open the bag at the end to crisp it up a bit, or would that dry it out? Can you add veggies to the bag with the turkey too, or does that affect doneness in that area of the bird? Wow, Annie T, did you see this??? I tried this two Thanksgivings ago when we had such a large crowd we needed a turkey and an additional turkey breast. There was no way I had oven space for all that turkey and the other parts of the meal. Making the turkey in advance worked so well I did it again last year when we had a much smaller crowd. No more worrying about if the turkey would be done in time. No more trying to fit way too many pans into one oven. No more calling hubby away from guests to carve the turkey. Reheating the turkey produces the same scents as cooking the turkey does. No one noticed the difference in technique. How is it that I’ve never considered baking the turkey ahead of time?! I will have to try that next year when we cook it. This year, I work the days leading up to Thanksgiving and won’t have the time to do it in advance. Thank you for the awesome post! This is what I do also cook before ,debone carve, then reheat with broth.I love the name heavenlyhomemakers,so glad I found you! Thank you, thank you, thank you! I cooked my turkey nearly a week before Christmas, deboned it, and froze it in baggies. After thawing and reheating it in 2 cups of broth, it was so delicious. I think I would go so far as to say that it was the most moist and flavorful turkey I have ever eaten. Thank you so much for all of your helpful tips. I am a foodie. I am going to share this recipe with my wife, she is making a good recipe for turkey. Definitely, she will try this. Always, she adds some onions for flavor in turkey preparation. Now, I am waiting for this preparation, hope she doing well. Thanks, for sharing this delicious recipe with us.